PlanarView AppPlanar Systems has launched its PlanarView visualization app, an augmented reality tool that assists people when they envision and plan their display environments. 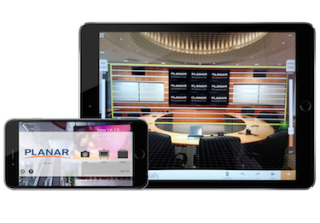 A free app for display solutions, PlanarView goes beyond other planning tools by making it possible to virtually design and visualize display solutions into a user’s real-world environment. Using the latest augmented reality technology, this ultra-modern app enables customers to overlay Planar displays on top of photos of their actual spaces, design product arrays and provides a truly realistic and professional visualization of their designs. Using PlanarView, AV integrators, architects, and interior designers can streamline the design and planning process by offering a realistic design for commercial display solutions to their customers—all at the touch of a smartphone or tablet. The tool is also useful for corporations, retailers, hospitality firms and other end users who want to accurately visualize the configuration of their selected Planar displays in their real-world environment before making a purchase. PlanarView Video Wall DesignTake a photo of the space: Users of the app can take a photo of a space from their mobile device by tapping the “create” button from the home screen and photographing the environment. They can then add scale and proportion by outlining the corners of their space and using a slider to indicate the dimensions. PlanarView is available for iPad and iPhone on the Apple Store and requires iOS 8.3 or later. Future versions are planned, including apps for Android and Windows. To watch a video demonstration of the PlanarView, visit Planar’s Vimeo channel. Click here for more information about PlanarView.